Hi, it's Mona here! 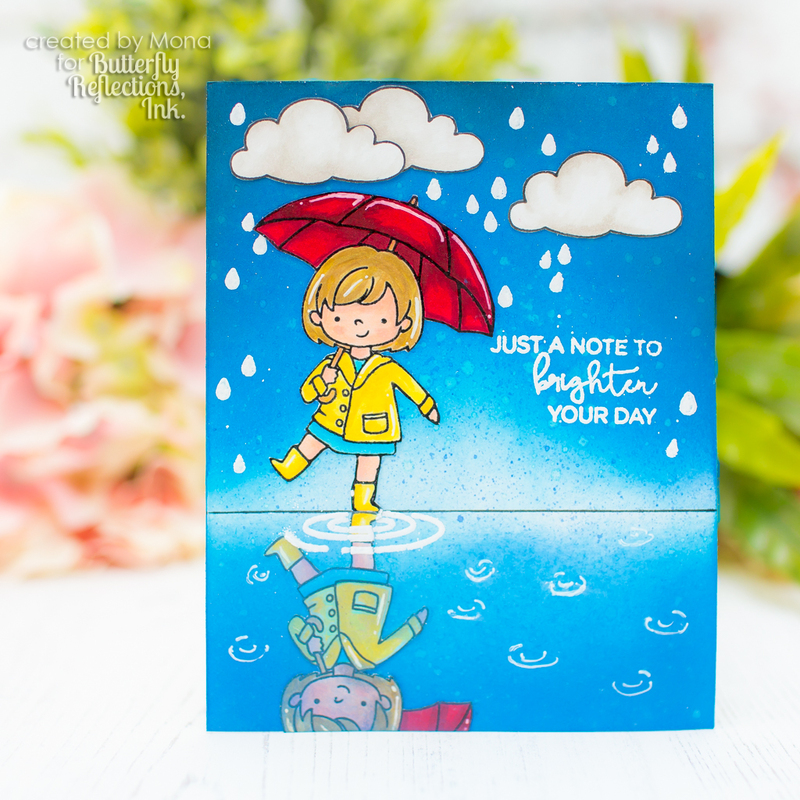 Today I will show you a summer rain card created with Hello Bluebird Rainy Day Stamp Set. First I made my mirror looking background with Blueprint Sketch and Salty Ocean Distress Oxide inks. After the ink blending with Mini Ink Blending Tool I made some splatters with water and Distress oxide inks. 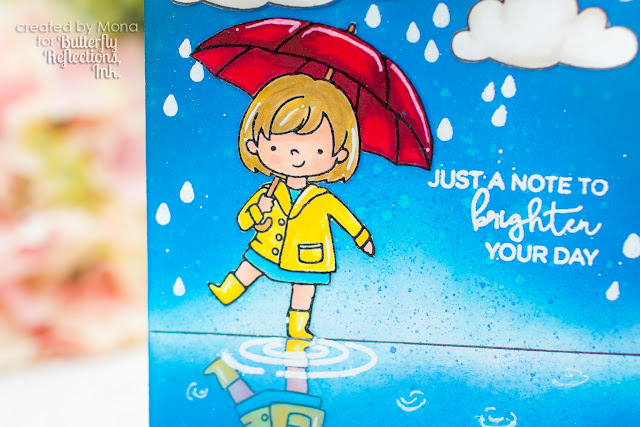 I heat embossed the sentiment to the background with Versamark Watermark Stamp Pad and Altenew Pure White Crisp Embossing Powder. 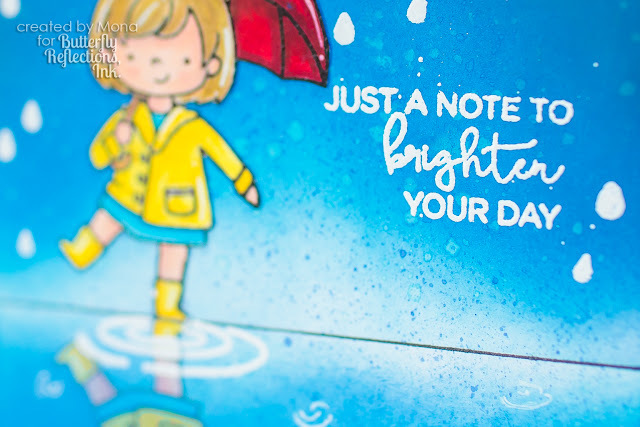 Next, I stamped my images from the Rainy Day Stamp Set. I used mirror stamping technique on the girl with umbrella. For this technique I used the Backdrop Stamp from Neat and Tangled. Finally I colored them with Copic markers, fussy cut them and glued to the card base. Also added some final touches with Uni-Ball Signo White and the card was ready. Thank you very much for reading through my post, I hope that I have inspired you! If you like my creations follow me on Instagram. This card is sooooooo amazing! I'm trying to understand exactly how you accomplished the mirror image of that stamp! Do you have any plans to make a video tutorial? This is cuteness overload! I absolutely love this card!!! Your ink blending and coloring are amazing! Oh wow!! This is fabulous!! I LOVE the mirror stamping!!! Such a cool effect!! 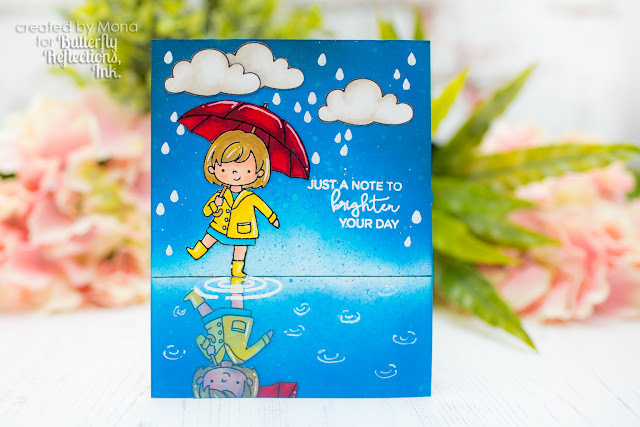 The way you colored this card all is in is fabulous too! Mona, this is seriously incredible and I would just die for a video tutorial!